Are you ready to shoot for the Moon!? 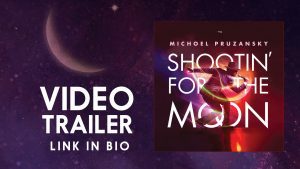 Michoel Pruzansky’s fifth solo album, “Shootin’ For the Moon” is finally here! “Shootin’ For the Moon” features what are sure to be hit songs at Weddings and Simchas for years to come. Produced by Michoel Pruzansky and Yochanan Shapiro, Yochanan arranged many of the choirs and composed the songs, Shuvi, Hareini, and Uvirtzoncha. World renowned composer and hit-maker Eli Gerstner’s compositions and arrangements are all over this album as well. Eli composed two songs on the album and directed the music on several of the tracks. The album also features hit songs from the Israeli duo Eli Klein & Yitzy Berry. Some of the hottest composers of our generation are featured on the album such as: Yitzy Waldner, Elie Schwab, Naftali Schnitzler and the exciting new producer, composer and arranger, Doni Gross. Making his production debut is co-producer, Ilan Schnitzer who aside from managing Michoel all year round, helped ‘Pruz’ mold this album to be the mega hit it is. In addition to Naftali Schnitzler and Eli Gerstner songs were arranged by Ian Freitor, Shai Barak, Eli Klein & Yitzy Berry. Shootin’ For the Moon will be distributed by Nigun Music and be available in stores everywhere, and online for digital download in the coming week.